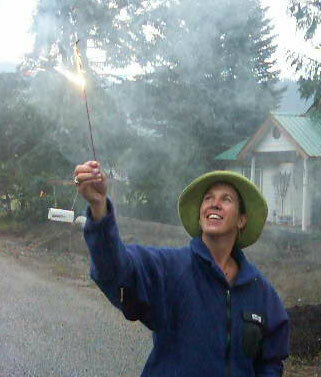 July 9th, 2007 at 9:05 pm Dear DanO, The smile the, the humor, the love shows in Sandy’s 4th of July pix. We miss her so much. Going through our Mary Ware loss, it has been hard not to be thinking of our Sandy too, even though Mary was a wonderful age of 85, it’s still “too soon”. This is Sandy’s birthday week, we are fortunate to have her in our life (make note, we HAVE her in our life). Special note: Sandy would want you to be careful on that yellow “moto”, you enjoy though. Hope to see you at the Garden of Memory this week. Love always, your friends H&P and Clover Barky Bark Bark.